Hold on to your lunch. I have to talk about stuff occurring that is not horrible and depressing and, in fact, makes me happy. I know, the thought makes me uncomfortable too. It is all very unseemly but we can get through this bubble of non-hell together. Soon things will be back to the normal drudgery I promise. I feel so jolly right now that I’m convinced a car is being manufactured somewhere in the world that will ultimately crash into and kill me. You know how the universe works. Here goes. I wasn’t going to say anything but then I realized that not everybody is on the Twitter so they may have missed this slice of cosmic fortune. See that new Halloween header at the top of the page? See that ROB ZOMBIE quote up there? I didn’t make that up during a late night drinking binge as you might suspect. That’s the real deal. 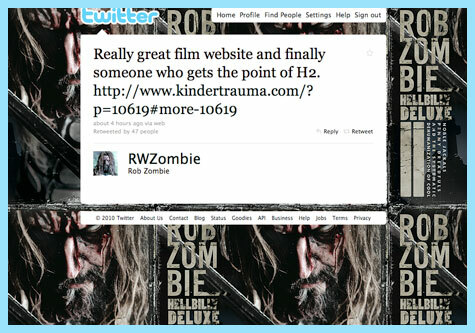 Yes, ROB ZOMBIE tweeted about good old Kindertrauma! He came upon my impassioned H2: Director’s cut review and he appreciated my appreciation. Is that not gold? I know there are both crab trees and Evil-lyns out there thinking, “Sure he likes your review because you love his movie!” to which I say, “Oh, you poor sad, misguided…dumb-dumb. It’s not about the love, it’s about the understanding.” ROB and me are now super best friends forever and you’re just going to have to get used to it. Your jealous scorn only tightens our bond. Seriously though how cool is that? How satisfying to know that my ramblings reached the one who inspired them. I’m just sad that I’ve already written two reviews for H2 because frankly I’d like to write five more. Maybe I will. I wonder what the hell my horoscope predicted for last weekend. Did it say, “You are about to encounter greatness” or “Your self delusions are about to hit a fever pitch.”? You see, I also encountered the one and only JENNIFER RUBIN! I’ll let that ferment in your brain a tad. Yes! Aunt John and I went to the fanciest town in the universe, Baltimore, to hob knob with the rich and infamous last weekend at a MONSTERMANIA convention. We finally got to meet the Miss Yvonne of our playhouse AMANDA BY NGHT in person for the very first time. 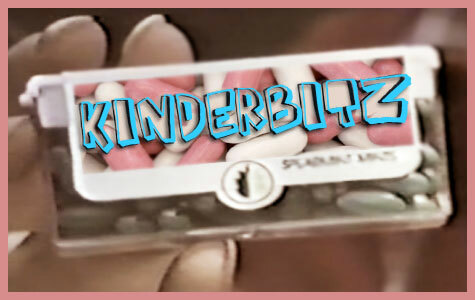 If you follow kindertrauma you’re surely familiar with Amanda from her multiple Funhouse hosting stints, her informative comments and her non-stop enthusiasm. I have to thank Amanda for showing A.J . and me around and introducing us to her cool friends including but not limited to DANIEL FARRANDS who did such an incredible job with that NEVER SLEEP AGAIN : THE ELM STREET LEGACY documentary ( if you haven’t seen it yet change that.) It was a stellar weekend and a great time was had by all. That song you hear growing louder in your head is Lakme because this trip to glamorous Baltimore was fate’s way of bringing JENNIFER RUBIN and I together at last. O.K. I know this picture is weird and it looks like RUBIN is a lifeguard who drug a drowned victim out of a swamp but what can I do? God was obviously watching both Howdy Doody and NIGHT OF THE LIVING DEAD when he decided to invent me. B-SOL of VAULT OF HORROR saw the new I SPIT ON YOUR GRAVE remake and his thoughts are HERE! VICAR of VHS caught ATTACK OF THE BEAST CREATURES which I’ve always wanted to check out and have neglected to HERE! My pal Christine from FASCINATION WITH FEAR goes a little psycho HERE! ARBOGAST does something beautiful with graveyards HERE! Funhouse winner BILLY V. suggests you get right over HERE! ZOMBIES ARE MAGIC talks about one of my favorite movies HERE! NOW KINDLY UNDO THESE STRAPS cracks me the hell up HERE! Well, I can only throw my hat in the ring with Mr. Zombie on this one. I’m glad you guys are seeing some positive responses for your positive responses. Bestest site on the internets. And I was saying that before I won a nifty new book! Now I’m sad. You were in my home city and I didn’t even know. Ah well, maybe next time. Or maybe not since you’re now all buddy buddy with Mr. Hollywood Big-shot Rob Zombie! Ah, rats Jergy! I didn’t know we were in your neck of the woods! If we’re not in Hollywood and I’m not visiting Niagra falls with Jennifer Rubin or hit by a phantom car we will make sure to look you up next time! Great crab cakes by the way! You two were beyond fabulous. I had a lot of fun hanging out with the masters of Kindertrauma. I also like you and Jennifer together. I loved that she was wearing that purple bag dress. It was so haute couture (sp?) for a horror show! She looks good. I know Dan enjoyed meeting you guys as well. Like myself, he thinks KT is a wealth of horror info! Keep it up! That picture of you and Rubin is priceless. I have never, ever seen that look on your face before. Love that picture LaDracul! 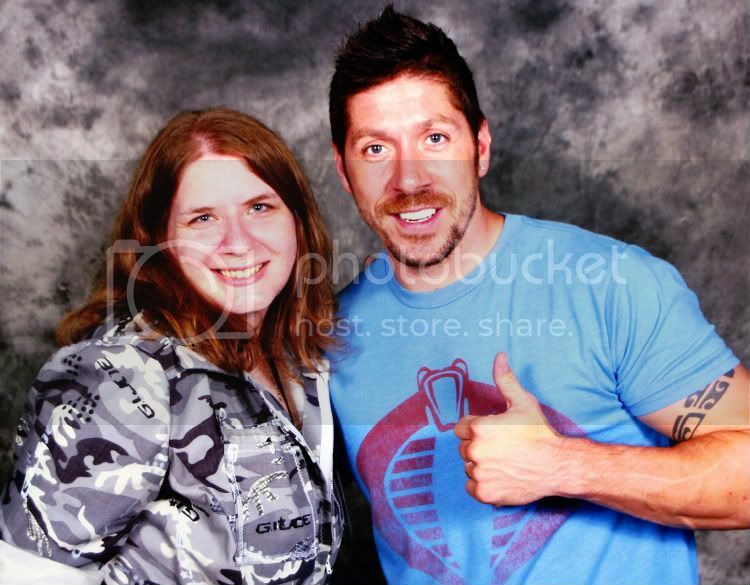 I saw Ray Park at a con and I neglected to get my picture taken with him and I’ve always regretted it! He’s a cool guy!